Why give a gift card in a plain old envelope when you can present it in this beautiful pop-up card? This pop-up gift card holder template can be adapted for any holiday or occasion. Just change the greeting and make several for your kids’ teachers to show your appreciation at the end of the school year, which is coming up soon for many! 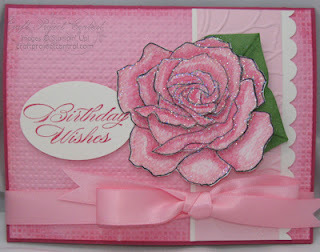 This beautiful pop-up gift card holder project comes to you designed by the fabulous, Kim Score. To get the instructions for this great project, that you’ll use over and over again, just subscribe to April at Craft Project Central! I'm also really excited to share that I was asked be a guest designer (once again) for the month of May at CPC! :) Thanks for stopping by today! Beautiful!!! Love the sparkly touches. Congrats on the guest spot!